MSD’s standard fuel kit is kept simple thanks to Atomic’s built in fuel rails and returnless design – less hardware to put together and less fuel line to run. 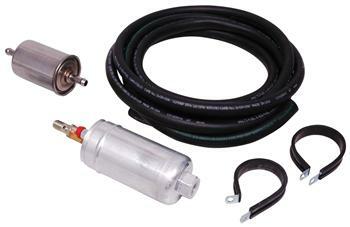 All you need for this kit is included – PWM Fuel Pump (MSD PN-2225), Post Filter, 15 feet of 3/8 I.D. fuel line, mounting brackets and EFI specific fuel line clamps. All of this is designed to work with your vehicle’s existing sending unit in the gas tank so there is no need to mess with your tank at all. The Atomic’s standard fuel kit can handle up to 525 horsepower at the crank, but at MSD we know there are plenty of street cars going well beyond that. When paired with a fuel pump that can supply enough fuel, the Atomic can support more horsepower than any of the competition! For all of you big block fans that love big power, we have come up with a fuel system that will support 620 horsepower at the crank! The High Horsepower Fuel Kit is a direct replacement for the Standard Fuel Kit. If you plan to run a return line with your Atomic EFI system, this kit provides a regulator, 15 ft of 3/8” line and the fittings to assemble.